NotesVideo: How to Cut OrangesKids Can! This salad is best if eaten as soon as it is ready. For fresh fruit: Rinse fruit and cut into bite-size chunks. For canned fruit: Drain fruit and cut into bite-sized chunks, if needed. In a medium bowl, combine the instant pudding mix and cold milk. Add the fruit and stir gently. Refrigerate for 5 minutes. 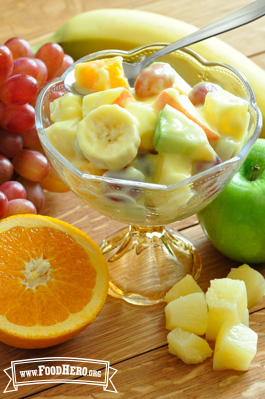 5 Comments for "Magical Fruit Salad"
Kids love this recipe. I let them choose which types of fruit is in season, and which canned fruit we will use! Fruit salad is my favorite brunch dish which I never get bored of. But I want to ask can I ask pomegranate seeds to this recepie of yours? You can use any mix of fruit with this recipe which is great for using what you already have on hand. I use one 6 oz. container of lowfat yogurt instead of the pudding. It is a fresh changed and the Vanilla yogurt blends all the wonderful fruit flavors together without over powering them. Delicious! I like this recipe because you can add whatever fruit you have on hand--add canned pineapple with fresh fruit like grapes and apples.